... he made a molding to propose for purchase on our Christian shop, are: - three statues of John Paul II, one of 130 cm available in two models ( religious statue of John Paul II in white and religious statue of John Paul II in patina ), a second statue of 85 cm, Statue of John Paul II, Apostle of the New Evangelization and a third: Statue of John Paul II, Pope of Families ; - a Child Jesus on the cross available in and monochrome ; - a Statue of Christ with Saint John . 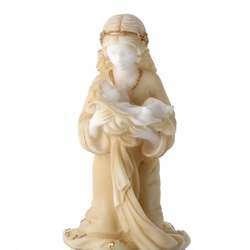 The religious statues that we sell are made of various materials: resin, reconstituted marble, reconstituted stone, polyester plaster, hydracal, jesmonite, plaster, staff. Certain materials such as jesmonite, reconstituted stone or reconstituted marble allow the religious statue to be placed outside. 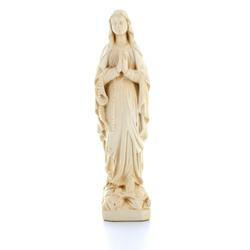 On the record of each religious statue we have specified this characteristic. 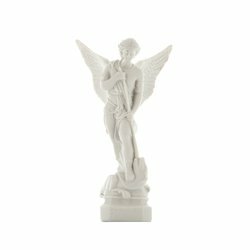 If, among the models of religious statues that we propose, you can not find the model or the desired size, do not hesitate to contact us . The sculptor brother of the abbey can make statues on request; he sculpts or restores only religious subjects. For more information you can go to: Sculpture Workshop . In spite of all the care taken with the quality of the small images, it is difficult to realize the artistic qualities of the statues only from the vignettes, so do not hesitate to go to the product sheet by clicking on the button "to see the product": with each religious statue we put several images; which allows to have a look from different angles for each statue or religious statuette . 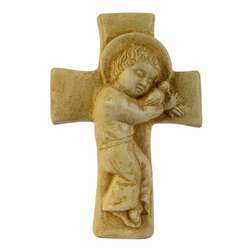 You will find below some details about the different categories of religious statues . If you are in a hurry you can do without this reading and click directly on one of the categories above. Good visit ! 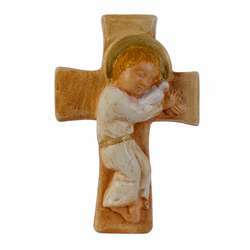 In addition to the statues of the Sacred Heart , you'll find in this category a statue of Christ and of Saint John and two Child Jesus on the cross. 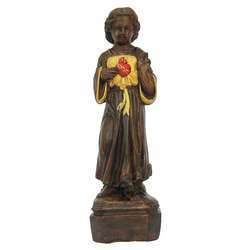 Among the statues of the Sacred Heart we invite you to admire the statue of the Sacred Heart of 45 cm, reference SC45BC . 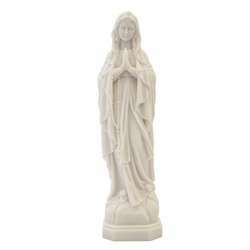 On this occasion, it is good to remember this promise made to Saint Margaret Mary by Our Lord himself: "I will bless the houses where the image of my Heart will be exposed and honored"
Among the different statues of the Blessed Virgin on sale, the variety of not missing. 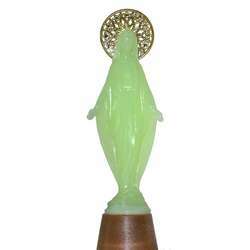 As a Miraculous Virgin, do not miss a look at the 35 cm statue MIRAMR35 . The statues of the virgin protector and from the Virgin to the bird ( your stone or your wood ) present two topics little known but charming and delicious. 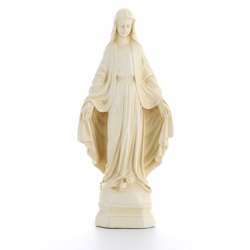 For fans of the medieval style, we draw their attention to the three models of statues: Statue of the Virgin of Autun , Statue of the Gothic Virgin , Statue of the Virgin Mary Queen . 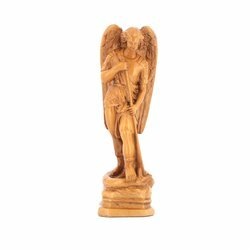 With 17 templates, you can easily find in this category the statue of Saint Joseph that you are looking for ; available sizes range from 15 cm to 79 cm. 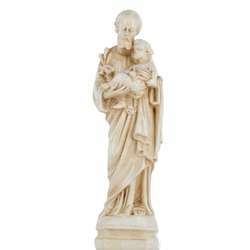 If you want an even larger statue of Saint Joseph, do not hesitate to contact us: we have what you need. 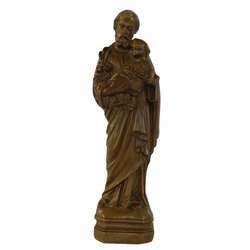 In addition to the classic models where Saint Joseph carries the Child Jesus asleep on his left arm, we have a statue of Saint Joseph craftsman, a very beautiful statue your wood ( Statue of St Joseph , reference SJO28BC ) where Saint Joseph carries on the right arm the Child Jesus and a statue where the Child Jesus blesses. 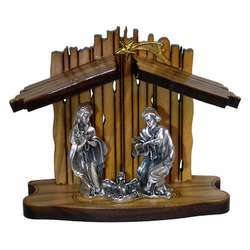 Among the statues in this category you'll find a crèche, a statue of the Holy Family available in three shades: light wood , ton pierre and polychrome . 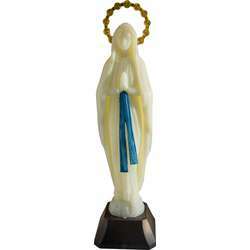 The statues of saints currently on sale are: St. Bernard (two statues), St. James (two statues), St. Curé of Ars, St. Paul, St. Therese of the Child Jesus (two statues), St. Joan of Arc, St. Francis of Assisi, St. Michael (two statues), St. Benedict, St. Jude, St. Vincent, St. Elizabeth of the Trinity, St. John Paul II (three statues and a bust). Perhaps, we forget, so do not hesitate to go to the page concerned. 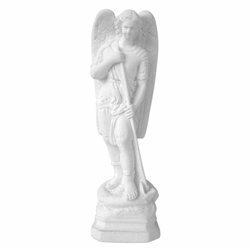 It is very easy for us to add other models of religious statues ; so do not hesitate to contact us if you can not find the saint you want! 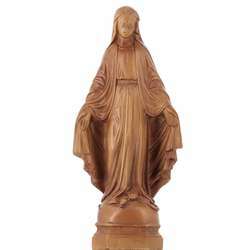 The religious sculptures of Yves le Pape are world famous. 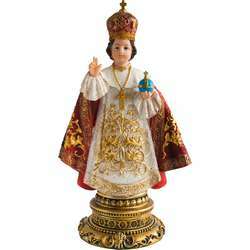 So we've dedicated a category to those religious statues that exude joy, purity, simplicity; these religious statues encourage us to ponder the religious mysteries represented; with his religious statues , Yves le Pape reminds us that true joy exists but we must go and find it where it is.